Each year, a flock of Cupids pours over the country and takes aim at unsuspecting citizens inside dimly lit restaurants, dreamily appointed gazebos, and the backseats of 14-year-old station wagons. Unfortunately (or fortunately, let’s be real), they often miss those of us who remain at home binge-watching romcoms in our basement. But don’t worry, you’re not alone in being alone. So what parts of the country are least likely to be stricken by the love bug? Grab your coziest blanket, crank this song (trust us), and read on to learn the loneliest places to live on Valentine’s Day. If you’re interested in what phrases we included in our index and how we calculated our rankings, check out our methodology section. The District of Columbia isn’t just home to our nation’s capital—it’s also home to our nation’s loneliest group of people. The US Census Bureau reports that 70% of DC’s adult population is single, which is more than 20% higher than any other region in the country. It’s not all bad news, however. DC residents search for “best dating apps” more than any of the other queries on our list, so at least they’re looking for love! Sliding into the number two spot is South Carolina. Nearly 49% of the Palmetto State’s population is single, and its most searched term was “I’m lonely” (a common trend among our top ten). Arizona may have joined the union on February 14, but its residents certainly aren’t feeling the love. Although it has a singles rate only 0.05% lower than South Carolina, Arizona’s total number of unmarried residents is nearly double. So if you’re looking for love, you might find it in beautiful, sunny Arizona. It doesn’t seem like the Windy City’s home state is blowing many kisses since it ranks as the fourth loneliest place to live in America. 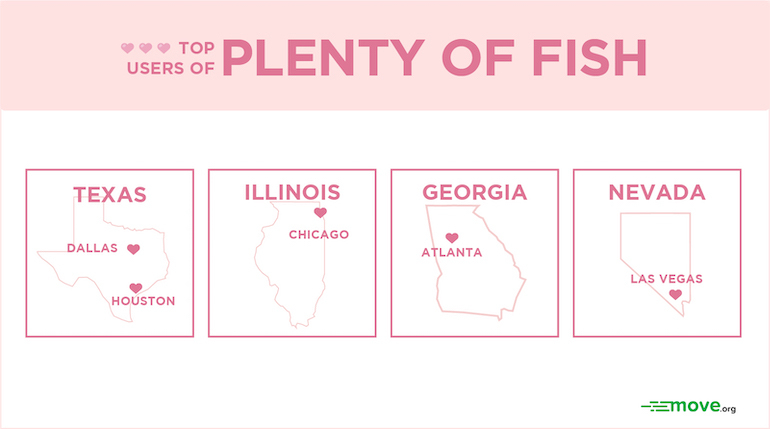 However, Kate MacLean, PR generalist for online dating service Plenty of Fish, reports that a lot of Chicago residents are at least searching for a soulmate—Chicago has one of the highest concentrations of the site’s users in the country. 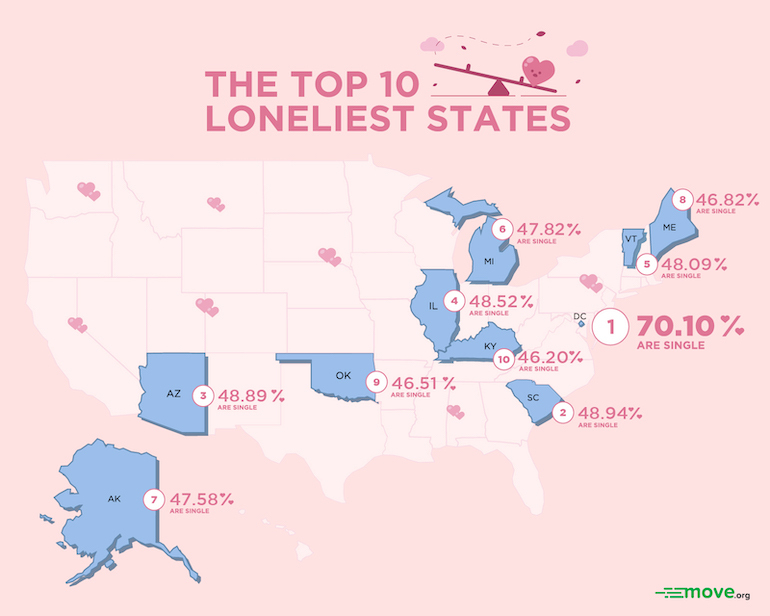 Vermont’s the next place on our list that seems to expect a lonely Valentine’s Day. In fact, “loneliness” is Vermont’s most searched term from the phrases in our loneliness index. Although Michigan’s surrounded by giant freshwater lakes, the water might get a little saltier this time of year (): the Great Lakes State is the sixth loneliest place to live in America. Michigan’s percentage of single adults comes in just below 48%, putting the dating pool at about 3.5 million people. So there are plenty of options for Michiganders who are still looking for a Valentine’s Day date! With so much open space, singles need to go to great lengths to find love in Alaska. But hey, at least it’s easier than finding it in DC (the loneliest place to live on our list). Maine is the only state in the nation with a single-syllable name—so it seems all too appropriate that it’s home to so many single people. Maine’s percentage of singles is 46.82%, which means almost 500,000 people are legally unattached. Oklahoma ranks as the ninth loneliest place to live in America. And based on its most-searched term from our loneliness index, we’d say Sooners are probably okay with that. Oklahomans googled “Anti Valentines Day” more than any other phrase from our list, so we’d say it’s a good place to live if you’re looking for something unromantic to do on February 14. Last but not least, the tenth loneliest place to live is Kentucky. “I’m lonely” is the most searched phrase here, so a whole lot of people seem to feel blue in the Bluegrass State. We ranked each state based on two factors: each state’s percentage of singles and a loneliness index. The percentage of singles was taken from the 2017 US Census Bureau estimates and includes anyone that’s not currently married and is twenty years old or older. The Census Bureau’s youngest age group for this data ranges from 15 to 19 years old. We opted not to include this subset since it started at such a young age and nearly 98% are single. 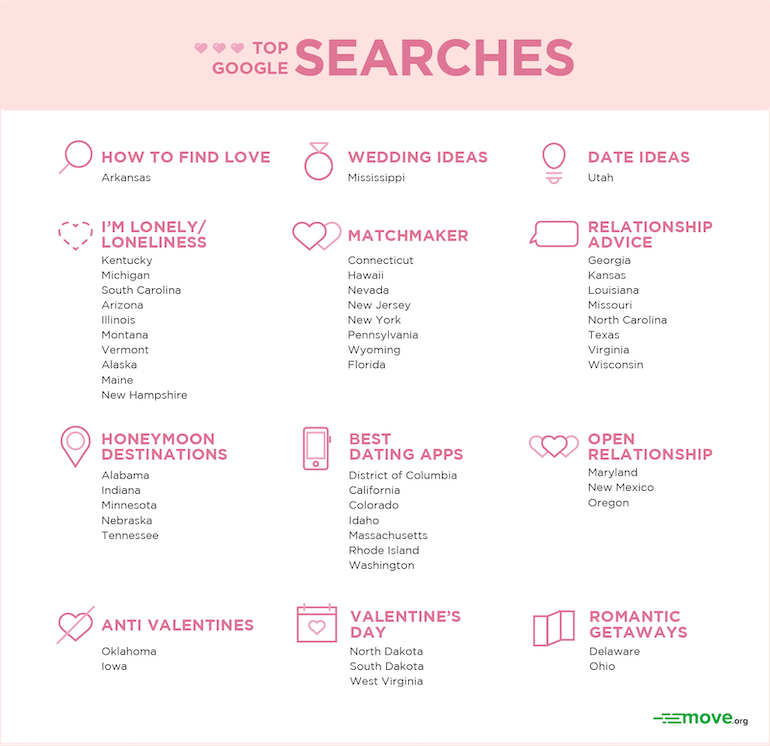 The loneliness index was determined based on search queries using Google Trends. We divided these queries into “loneliness index categories” and assigned each category a rating from one to three (of course, one is the loneliest number). The percent of singles made up 60% of the final score and the loneliness index made up the remaining 40%.